For various reasons, certain designers have stuck in the collective consciousness as being the single greatest creative minds of their times. Gabrielle Chanel and Madeleine Vionnet are good examples: as you know, some hold them up as the only important couturiers of the 1920s because they're the two remembered couturiers of the 1920s. When it comes to the mid-to-late 19th century, a similar issue crops up with Charles Frederick Worth. One might conclude that his was the only couture house for the discerning, wealthy woman, but that's not the case. 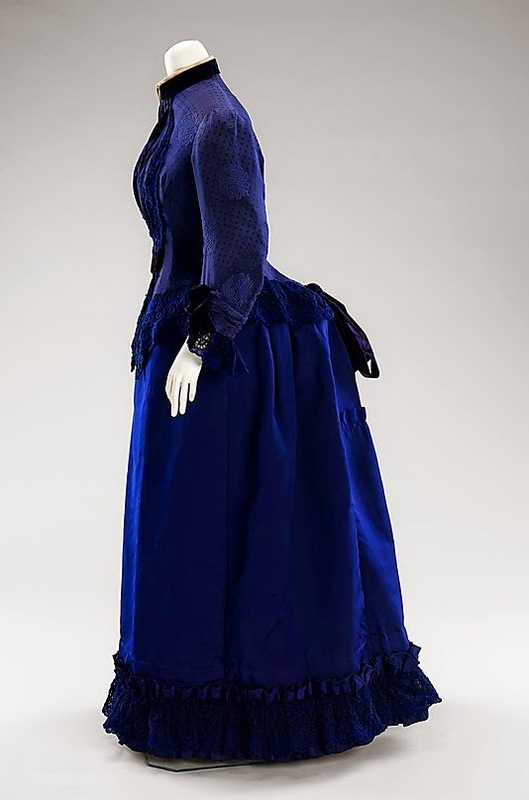 Emile Pingat was Worth's contemporary and equal in the eyes of many American and European women of the period. Very little is known about Pingat's life, early or later. In 1860 he was first listed in the Paris directory as "Pingat, Hudson et Cie", at 30 rue Louis-le-Grand, (see 1862) selling "nouveautés confect[ionées]";* by the latter half of the decade, Hudson and Co. had gone, and Pingat was solely in charge. 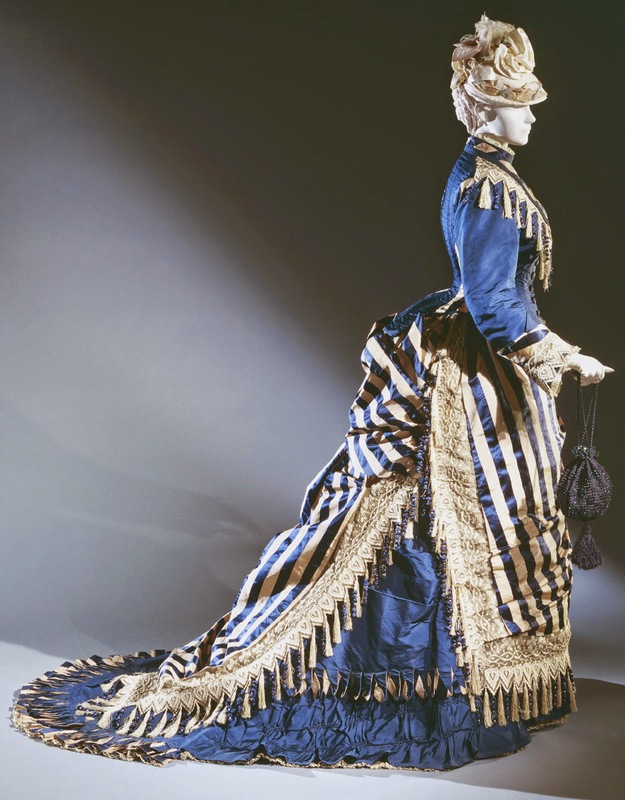 While this other early Pingat evening dress uses more layers of tulle and applied decorations, it's clear that he had an elegant design aesthetic that involved extremely detailed work in small areas, and the use of different fabrics in matching colors. To be honest, I think the level of excellence in proportion and cut surpasses that shown on Worth garments of the same vintage. Neither Worth nor Pingat turn up in any books or magazines I can find online from the 1860s. But in the 1870s, both are mentioned frequently and almost always in a pair, in both discussions of new fashions and in fiction. 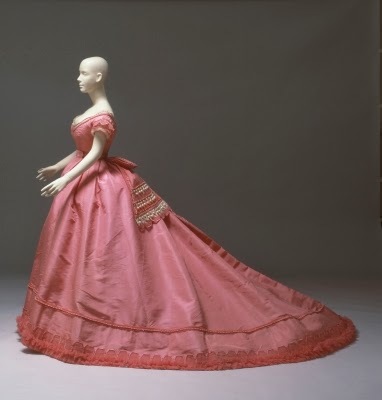 While Pingat was clearly (based on these sources, too many to cite separately) considered very talented and his creations beautiful, there's definitely a sense in many texts that Worth was the pinnacle of fashion. However, several other designers are mentioned as also being of great importance. In the 1880s, Pingat is most consistently referred to in the realm of wraps: Godey's in 1884 (1, 2), The Story of Helen of Troy (1881). However, Pingat gowns of this decade do still exist, and there are still references to them in magazines and fiction. In one magazine he is referred to as "the most artistic of the Parisian dress-makers" (while Worth is "pompous and official" and dresses "showy" actresses; the writer also sees Félix as their equal, and mentions a Mme Rodrigues who appears as autocratic and sought-after as Worth); What Can A Woman Do (1885) describes Pingat and Worth as "the two greatest dressmakers in the world". Pingat's design sensibility in outerwear differed from that in his dresses. 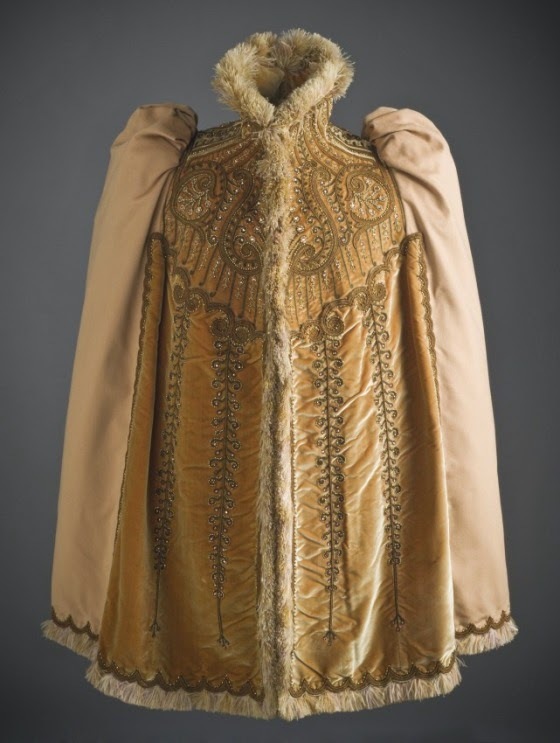 While Pingat gowns tend to be mono- or bichromatic with intricate trims not detracting from the rich fabrics, the fabrics of Pingat outerwear are usually a backdrop for intense beading (though the same stark, almost modern aesthetic is frequently seen). The gowns are masterpieces, but it's easy to see why he became so well-known for mantles and wraps. According to the excellent post on the FIDM blog, Pingat left his house in 1896, at the age of 76, selling it to A. Wallès, who chose to move his own business into Pingat's quarters rather than continue under the other's name. Wallès is difficult to find much about, but what little I've come across puts him at Pingat's level in the opinion of the world. Everybody's Magazine (1902) shows a color plate of one of his designs alongside Beer; "The Growth of a Paris Costume" in Lady's Realm (1900) lists him with Worth and Paquin, and uses his company as an example to show how a fashion house works (with photographs - a very interesting resource). Sadly, there is little-to-no information about Pingat as a person online, and few books offline. The Brooklyn Museum held an exhibition in 1989 titled The Opulent Era: Fashions of Worth, Doucet, and Pingat (pictured here, no captions, though some of the garments are recognizable and it's possible to make educated guesses about the rest) and it seems a book came out of it, but it's not in my library system and costs hundreds of dollars. What was Pingat like as a person? Who were his family members? Where did he apprentice? Which clients recognized his talents early? Until someone does in-depth research in Parisian archives, it's a mystery. * Worth & Bobergh, in the same book, are listed as having the same; later, in the section for couturiers, they were described as having robes et manteaux confectionnés, soieries, hautes nouveautés in the Rue de la Paix. (Pingat does not appear in that section.) Nouveautés are the newest and most fashionable gowns. Confections were ready-made items, according to the guidebook excerpted later. I honestly don't know what to make of this yet - I conjectured the end for "confect." for Pingat based on Worth's first reference, which makes the description for both in the standard directory "ready-made new designs". This has been translated/explained as "outfitter of fancy designs", but I'm not sure that's necessarily what was intended. The whole thing is very confusing. ** The 1881 Baedecker lists all three of these as the most fashionable and expensive milliners/dressmakers. An 1887 novel, As in a Looking Glass, says that Laferrière is a woman (or possibly that his wife was highly involved with the business - another reference is to Laferrière as a man). I have also found references to "Pingat-Laferrière" - the two houses may have combined, with Pingat's name taking primacy as the more successful partner. So interesting! Personally I tend to like Pingat's gowns more than Worth's, overall (blasphemy?!). I saw the blue-and-white-stripe dress in an exhibit years ago, and it's stuck with me as one of my absolute favorite bustle dresses! I think I do too - the white one might be my favorite. The closeups on the ends of those ... petal/sashes are incredible! Thank you. I actually wasn't familiar with his name and I love that time period. Now I'm going to have to binge pinterest him. You're welcome! Unfortunately, I don't know how much bingeing is possible - there's just not many Pingat pieces out there.